Nile Rodgers is THE greatest Groove Producer of all time. Nile Rodgers is one of the greatest record producers of all time, period. He has been one of the biggest influences in my musical life since I was a teenager. Nile comes from the Miles Davis school of “It’s not what you put in, it’s what you leave out”. When Chic hit in the late 70’s, I was blown away. Nile, Bernard Edwards, and Tony Thompson were so tight they sounded like no one else. I’m still blown away listening to those 37-year-old grooves. 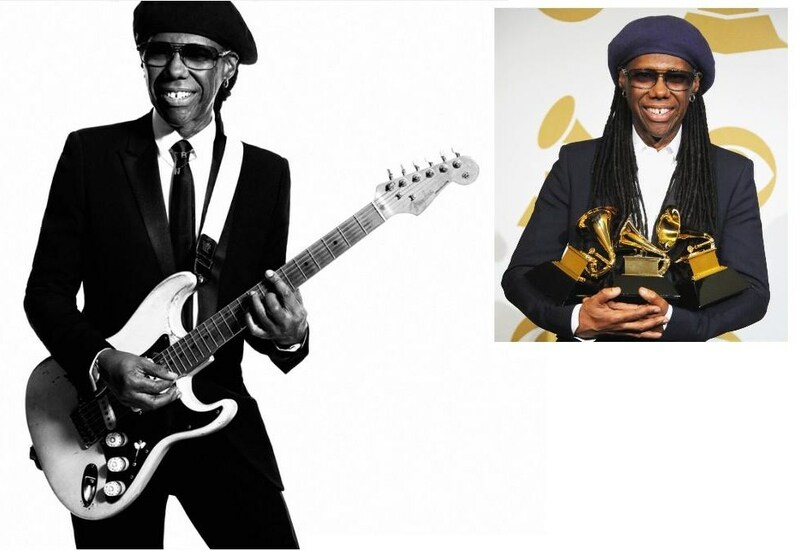 Nile parlayed the massive success of Chic, along with his virtuoso guitar skills into a production career of some of the biggest albums of all time (Bowie/Madonna/Duran Duran/Michael Jackson/Diana Ross). I couldn’t be happier for Nile recently winning three Grammy Awards for his stunning contribution to Daft Punk’s Album of the Year. The fact that his work is still relevant, and his contributions are still at the top, decades after his breakthrough is a testament to his unique and truly otherworldly musical gifts. Nile also received the 2014 MPG Inspiration Award from the Producers Guild, last Thursday night. I first met Nile in 1986, as I was spending a great deal of time in Manhattan around the Power Station. The last I saw Nile, he couldn’t have been more generous and engaging. Tonight Nile will perform at the 2014 Brit Awards with Pharrell, and later at the after party at the Savoy Hotel (Stunningly and long pushed for) with my favorite Aussi Doll Kylie Minogue. It should be a groundbreaking night for many reasons. I will write more after the Brits. Fifty years ago tonight, on February 9th, 1964, The Beatles performed on the Ed Sullivan Show in CBS Studio 50 to a broadcast audience of 73 million viewers. The largest television audience in history up to that date. CBS received more than 50,000 requests for the 750 seats in Studio 50. Before their Ed Sullivan appearance, The Beatles had played more than 1,000 live shows. Few people in the general public understand that this is why they were so good by this date. Their electrifying performance on Ed Sullivan was the culmination of almost 8 years of work. They exploded on the American public, fully formed. This could never happen again. The world is too connected now. When thousands of kids were trying to get into the 250 capacity Cavern Club in Liverpool, years before Ed Sullivan, it would have been Twittered and put on Youtube today. The Beatles had the benefit of being able to grow organically, without hype, into what Eric Clapton would call “The Four Headed beast”. The Beatles performance on Ed Sullivan was so good and so unique that we are still talking about it 50 years later. Today’s music industry is largely filled with mediocre talent, saturation marketing, and hype. Some of the horrendous performances on the 2014 Grammys prove this… but on February 9th 1964, America saw a fully formed professional band whose performance and talent has never been equaled, and likely never will be.